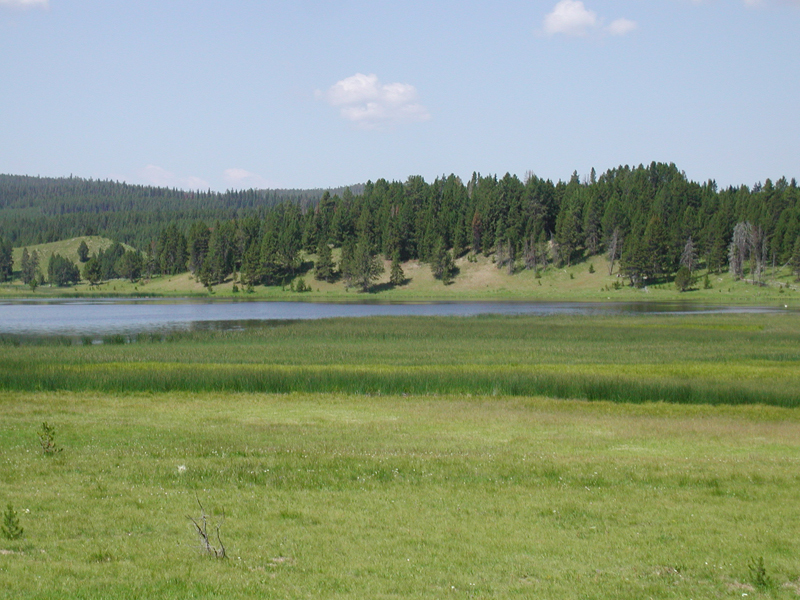 Our research focuses on the geomicrobiology of acid-sulfate-chloride (ASC) springs in Yellowstone National Park, and is directed towards understanding linkages among aqueous and surface geochemical processes and the relevant microbial populations that have coevolved in such habitats. The geochemical signatures of acidic hydrothermal springs within YNP provide a unique opportunity to study microbial populations that may utilize hydrogen (H2), arsenic (AS), iron (Fe) and/or sulfur (S) for metabolic processes (e.g. either as electron donors or acceptors). In addition, many acidic geothermal springs of YNP contain elevated concentrations of As(1-10 mg L-1); consequently, microorganisms inhabiting these systems may have evolved mechanisms for detoxifying As(III) or As(V), or for utilizing As in energy conservation. 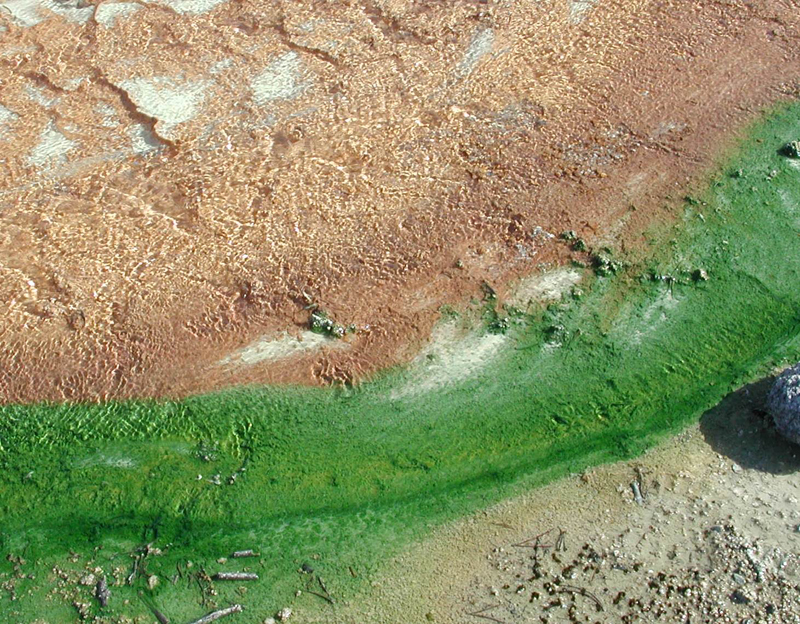 Our initial work in Dragon Spring (Norris Geyser Basin) focused on aqueous and solid phase geochemical analysis, and 16S rDNA community profiles of the important microbial populations responsible for the development and colonization of nonphotosynthetic microbial mats (Langner et al., 2001; Jackson et al., 2001). 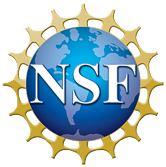 These initial studies represented the first thorough characterization of ASC thermal springs and provided an excellent foundation for obtaining a recently funded NSF Microbial Observatory project on chemolithotrophy in ASC thermal springs (McDermott, Inskeep, Geesey). We have completed two additional studies on different ASC thermal springs (Succession and Beowulf) which are characterized by source waters with pH values near 3, temperatures ranging from 75-85 °C, and that contain approximately 50-70 uM Fe(II), 30-70 uM As(III) and 50-80 uM H2S. The microbial populations associated with the deposition of Fe-rich microbial mats in Beowulf Spring are heavily encrusted with As-rich Fe-oxyhydroxides suggesting that the organisms play an important role in the initial nucleation and growth of this phase. Results from Succession Spring demonstrated patterns of microbial distribution across geochemical gradients, including Stygiolobus and Caldococcus-like populations at 75-85 °C important in S cycling (0-2 m), Hydrogenobaculum-like populations at 55-75 °C (2-12 m), and possible Fe(II)-oxidizers such as Metallosphaera, Acidimicrobium, Thiomonas, and Thiobacillus-like populations in the Fe(III) deposition zone (8-12 m). Moving forward, we will focus on quantifying and isolating novel organisms relevant in these geothermal environments. 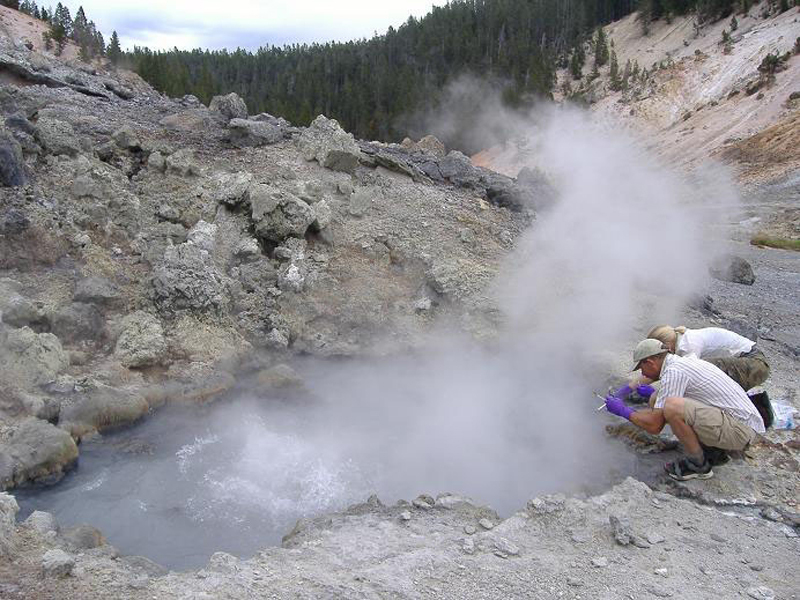 We have also begun a more thorough evaluation of the distribution of microbial populations in other acidic geothermal springs with variable geochemical signatures, including geothermal features in Norris Basin, Hot Spring Basin, Joseph’s Coat and Rainbow Springs (YNP). The geochemical properties of these thermal springs vary considerably with respect to concentrations of Fe, As, Sb, H2S, and other inorganic constituents. Characterization of 16S rDNA sequences from these environments will provide a unique data set for evaluating patterns of microbial population distribution in response to geochemical attributes. Our working hypothesis is that microbial speciation and geochemical speciation are inseparable in as much as they have defined one another during the evolution of adapted microbial populations. Acidic, oligotrophic, nonphotosynthetic geothermal environments represent extreme model environments to study such relationships. Consequently, we expect to find different microbial populations associated with variations in geochemistry, and furthermore we expect to define the interactions of guilds that comprise the microbial community distributed across temperature and geochemical gradients. The extent to which geochemical signatures can explain the distribution of microbial populations will make an important contribution to our understanding of microbial diversity in nature and more specifically, to the discovery of novel microorganisms that inhabit hydrothermal areas thought to be analogs of primitive environments on earth.